The server will then try to connect to the client at the IP address specified, and the port specified, and if successful, a data connection will be established, and the server will send the required data (or receive data) before closing the connection. When a client connects to a server (passive) or the server connects to the client (active) to establish a data transfer - this is known as the DATA channel. in my above demonstration, both the client and server were on a perfectly routed internal network. The issues start occurring when you have to go through a firewall, or if you're having to use Network Address Translation. Most homes and businesses use a Router that has built in NAT facilities, so when you connect to an Internet address, your internal, non-routable IP addresses are being translated at your NAT Router, and then re-forwarded out. SOME Routers are clever enough to KNOW that there's an FTP session in progress, and they automatically change some of your commands to compensate for the fact that your IP address is being translated. Unfortunately, this does not work when you're using SSL Encryption - because your router can no longer decipher the conversation. 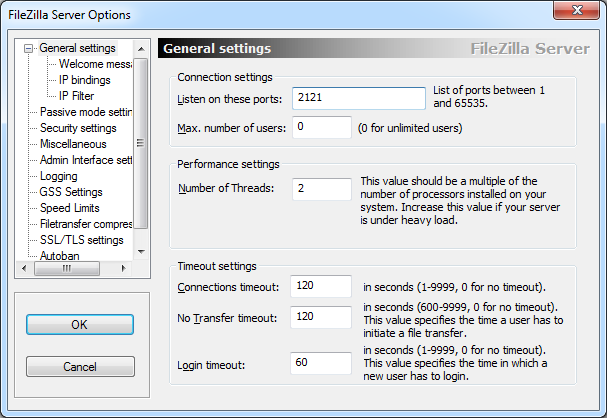 Passive mode FTP was developed for clients who would be using NAT technology, So that Instead of Servers connecting to the Clients (active mode), the Clients can connect to the Servers instead. Every NAT router will support this out of the box. The solution is really simple - Make your server co-operate with the NAT and/or Firewall. These instructions are for people who's servers are listening on public IP addresses, but they have a border firewall protecting them from attacks. Open a port outbound source IP - the FTP server, source port 20 - destination ip any - destination port any, protocol is TCP. This rule covers the DATA channel. Open an inbound port source IP any, source port - any, destination IP - your FTP server - destination port - port 21, protocol TCP. This rule covers the CONTROL channel. In addition to the Active FTP Rules, make the following configuration changes. You're all done! Your FTP Server will now function with clients which request an active or passive connection methodology. These instructions are for people who's servers are listening on private IP addresses (10.x.x.x, 172.16.x.x-172.32.x.x or 192.168.x.x, and rely on a NAT router to share their public IP. In addition to the Active Port Forwarding, make the following configuration changes. Configure your FTP Server so that it knows what to use as your IP address when doing passive mode. A Passive Mode needs to have the IP address of your Internet IP, not your internal IP. See sample below. Create a port forwarding rule to forward the range of ports you've selected to the internal IP Address of your FTP Server, protocol is TCP. Unfortunately some Cheaper NAT Routers like home ADSL ones may not allow you to forward a port range. In this case you have to create a single port forwarding rule for Each passive port you've chosen. For example, if you've chosen port range 10000 to 10010, then you have to create 12 rules in total - one for port 21, and the other 11 for ports 10000 to 10010. For the really observant, they would notice I'm using the non standard port of 2121 for clients to connect to! I hope that this tutorial has helped you resolve your FTP Server woes, and help you better understand how the FTP Protocol operates.